Sixty outstanding examples of folk art — by winners and recipients of honorable mention in FOFA’s 2016 juried competition for young artists — are on view in the center of Oaxaca, in the Salas Capitulares gallery of the Centro Cultural San Pablo. 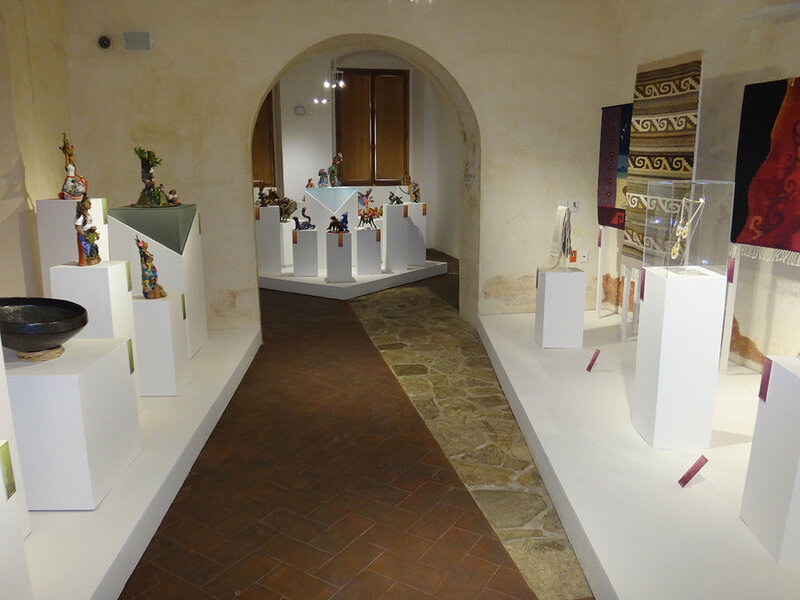 Exhibition entitled "Nine Footprints" A Look at Mictlán"
Sixteen young artists – winners and recipients of honorable mention in FOFA-MEAPO’s 2016 contest for young artists —who participated in a 13-week cultural history course (January-March, 2017) sponsored by FOFA – and thanks to a grant by Los Amigos del Arte Popular — collaborated to generate their own exhibition. They created works interpreting an ancient Mexican legend. Souls of deceased people made a long, arduous journey requiring that they overcome nine obstacles to get to Mictlantecutli and Mictlancihua (guardians of the Underworld); these guardians send souls to eternal rest in one of the four underworld houses — depending on each individual’s type of death. This exhibit originally appeared in Museo Estatal de Arte Popular Oaxaca (MEAPO) [Oaxaca State Museum of Folk Art] in San Bartolo Coyotepec from November, 2016-June, 2017. FOFA celebrated its 10th anniversary with 100 supporters who enjoyed the live marimba performance, mezcal tasting, visiting Oaxacan jewelry, collage and diorama artist—Francisco Hernandez Perez—and outstanding examples of Oaxacan folk art for sale. Proceeds will go to a fifth contest for young artists to take place in summer, 2018. An inauguration ceremony took place on July 15, 2017, attended by many of the exhibiting artists and their families, as well folk art enthusiasts. This exhibit originally appeared in Museo Estatal de Arte Popular Oaxaca (MEAPO) [Oaxaca State Museum of Folk Art] in San Bartolo Coyotepec from November, 2016-June, 2017. Young folk artists whose winning works are displayed in the FOFA exhibition at Centro Cultural San Pablo have been offered the opportunity to sell other pieces in a folk art market on the plaza of San Pablo. They have completed a preparatory course on marketing.